The ethical debate over Facebook’s mood-manipulation study that caught the nation’s attention over the weekend is certainly warranted, but the bigger debate goes far beyond Facebook. It also goes far beyond field of scientific research. It’s about something much deeper than A/B testing page designs and interactions with new features, or even using algorithms such as EdgeRank or PageRank to filter results in the name of better usability or effectiveness. Some of us might even celebrate that type of content manipulation. Rather, the study highlights the ease at which web companies can now collect and analyze an unprecedented amount of behavioral data (something we already knew they could do) and then, apparently, use it to affect how we behave. Not whether we stay on the site longer or click through to another piece of content, but the literal words we choose to type or thoughts we choose to share. And while it’s easy enough to laugh off this particular study (“Oh, no! I might not have complimented my friend’s baby strongly enough!”), there are plenty of situations where this type of manipulation would be no laughing matter. “Rather than tailor marketing content to a user’s unique emotional make-up, Facebook has shown that they can use tangentially related (and free!) user-generated content to push a user toward marketing content generated for a more general emotional state: insecure, hungry, lonely, etc. They can edit together photos and posts in a stream to skew a user’s view of reality and shift them into one of these compromised emotional states. “In other words, if they can’t use data to generate enough personalized content to target people, maybe they can use data to generate vanilla people within a smaller set of emotional states. Once you have a set of vanilla people, then your American Apparel ads will work on them without customization. It’s a cynical prediction, but it’s not entirely inconceivable either at Facebook or, perhaps more likely, some less-scrupulous social media site or app. What would be even worse is if manipulating a user’s state of mind led to more meaningful results than just some thoughtless ads. Some of the previous fears about big data — bolstered by our sharing of everything via social media, ratings sites and/or connected devices — have to do using using data mining as a means to a new type of digital discrimination. Think about bank, insurances companies or prospective employers deeming some of us too risky for low-interest loans, reasonable premiums or respectable jobs. We have written about it before, as have Tim O’Reilly and the White House. But Facebook has now helped demonstrate that maybe this type of discrimination can evolve into manipulation. Maybe the companies that already have undue influence over certain portions of our lives can exercise even more control by just helping decide what we see in order to “improve” our behavior. 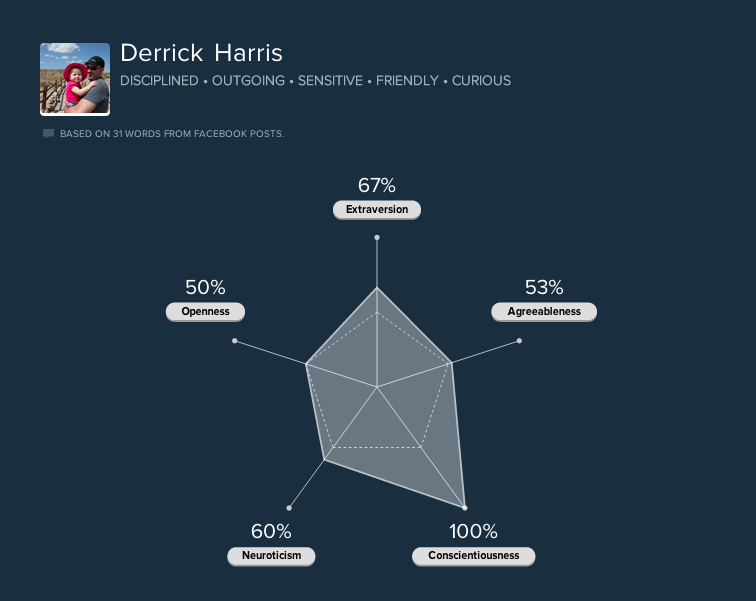 A personality profile from Five Labs based on Facebook posts. Maybe someone should help me turn up the agreeableness quotient. If you’re a company prone to questionable ethics, why not try to convince a company like Facebook to do a little research into whether it can make that happen? Why not convince it to try to make it happen? After all, the potential benefits to the bottom line would probably outweigh the risk of some nominal fine down the road. The public relations storm will blow over in due time. I’m not predicting this will happen or that the effects of it will even be noticeable if does happen. But we’ve now seen that it could happen, it could work and we probably won’t even realize it’s going on. For those concerned about the societal consequences of sharing so much data regarding what we’re doing and how we’re feeling, Facebook’s study provides plenty to think about. Feature image courtesy of Shutterstock user Sergey Nivens. INDIA IS LOOKING FORWARD TO FACEBOOK FOR ITS INCREMENTAL INCREASE OF TOURISM IN THE COUNTRY AS A SEQUEL TO THE LATEST MEETING OF COO OF FACEBOOK WITH THE PRIME MINISTER OF INDIA. Bammy really turned out to be humanity’s worst nightmare. Disgusting. The facebook study finding are just about the same as Walter Lippmann’s 1922 classic book “public opinion” in a chapter called “the world outside the pictures in our head”. “Agenda Setting” by news media for manipulation has been around for many many years to keep people comming back to watch the show. This may sound creepy but as an advertisor I need people who can be and are easy to manipulate borrowing money to buy more crap they don’t need that “they think” will solve their problems. this is another confirmation of how far ahead of his time Orwell was. That’s the problem with free services, they can do what they want. IMHO, this is not Orwell. 1984 dealt with the totalitarianism through Big Brother’s repression.